A sweeping reform proposal that made global headlines has evolved into a more modest pilot, designed to generate rigorous evidence. Liberia's public schools are failing. After years of civil war followed by the 2014 Ebola epidemic, the Ministry of Education does not have the capacity to run the national school system. Teachers often aren’t paid, and as a result, often don’t show up. Many students don’t either. More than 60 percent of school-aged children in Liberia aren’t in school, placing Liberia in the lowest percentile of net enrollment rates in the world. Not that going to school is a guarantee of much. Among adult women who reached fifth grade in Liberia, only 1 in 5 can read a single sentence. It’s hard to tell parents to keep their kids in school when they’re unlikely to even learn to read. Against that backdrop, Liberia made international headlines earlier this year when the Ministry of Education announced a radical proposal to convert its failing primary schools into American-style charter schools. These charter schools would be free, with no selective admissions, and staffed by qualified, unionized teachers on the government payroll. The plan became a media sensation. 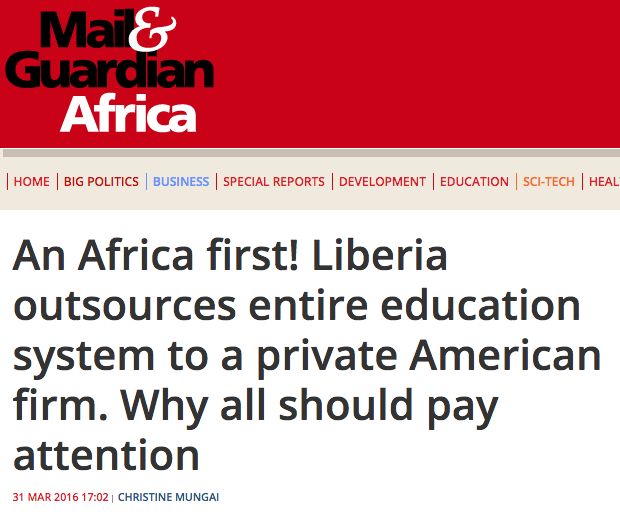 "Liberia outsources entire education system to a private American firm," was the headline in South Africa's Mail and Guardian. The UN's Special Rapporteur for the right to education declared Liberia's plan "completely unacceptable" and "a blatant violation of Liberia's international obligations under the right to education." Legally, that’s highly dubious, but his comments reflected a growing tide of opinion. So, over the next six months, the Ministry of Education went back to the drawing board and took counsel from local and international partners. What has emerged is a much more robust, and more modest plan, with stronger foundations for the future. Beyond the sensationalist headlines, the Ministry responded to a variety of domestic concerns, which had a very different tenor. Rather than opposing the charter school plan, many local stakeholders wanted to be part of the programme. Local education operators wanted to be involved, senators were eager to see more counties included, and aid donors working in Liberia wanted to see a serious evaluation before committing to any funding to current or future plans. The program that launches in September will start small, with 90 schools in the 2016/17 academic year. That’s still an ambitious plan for a poor country with limited bandwidth in the public sector. But it gives the Ministry a chance to see what works, to keep closer oversight of the process and to iterate the policy before making any decisions about the future of the program. While Partnership Schools will be smaller (in terms of schools) it will also be bigger (in terms of the number of players involved). No one organisation is getting monopoly rights over Liberia’s primary schools. This is a key lesson from similar models in other countries: the benefit of building a government regulated “market” of high performing school operators, who strive to raise educational standards by learning from and competing with each other to achieve better outcomes. So, after an open and competitive bidding process led by Education Minister George Werner and his team, the Liberian government has selected seven organizations to run its new charter schools—in addition to its original agreement with Bridge International Academies—including leading Liberian educational institutions like Stella Maris Polytechnic; large international non-profits like BRAC with a reputation for scaling up fast in hard-to-reach places; and private school chains like Rising Academies with experience running schools in neighboring Sierra Leone. The public side of a public-private partnership is just as important as the private side. These are public schools and, ultimately, the Ministry of Education needs the capacity to act as the duty bearer for education: responsible for all decisions to commission, scale and indeed terminate operator contracts. The evaluation will study the impact of the Partnership Schools program across a number of dimensions, including enrollment, attendance, learning outcomes, equity and parent perception and engagement. Evidence generated from the study is intended to inform the Ministry’s and donors’ policy decisions to continue or scale up the charter school model. It’ll also contribute to the international debate about the design and role of charter school-like policies in education systems. Beyond the RCT, the Ministry’s broader task is to ensure that the school operators are provided with the conditions they need to deliver, while being held accountable by government for the measurable results that they achieve for children. I’ve sent my children to New York City public elementary and middle schools that are not academically selective. Our elementary school has been active in the anti-charter movement. Liberia is different. The project should have been envisioned sooner, and the process should have been fairer. But if experimentation is justified anywhere, it’s there. It’s hard to look at Liberia’s educational system and say: Do nothing new. When classes open in September, Liberia is going to try something new. It will be an experiment, and like any good experiment, it should be judged on the empirical data it produces—data on whether these schools deliver better learning for Liberian children, both boys and girls, urban and rural. Until then, stay tuned. Susannah Hares is executive director of Ark’s Education Partnerships Group, a UK non-profit advising the Liberian government on the design of the Partnership Schools for Liberia program. Justin Sandefur is a senior fellow at the Center for Global Development, and a principal investigator on the external evaluation of the Partnership Schools for Liberia program.